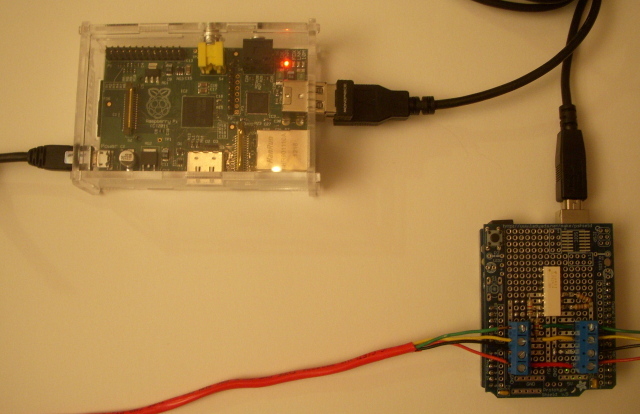 There are many ways of connecting the Raspberry Pi and Arduino, such as using the GPIO and Serial pins and using I2C. But this could be one of the easiest way to get them talking, because hardware that required is minimal: all you will need is a micro USB cable that comes with the Arduino. To Setup your Raspberry Pi, check out this article. To Demonstrate how this works, I will be doing two little projects, one for data going to Raspberry Pi from Arduino, the other one for the opposite. First of all, make sure you have installed pySerial, which gives you the ability to read from and write to the serial port with Python Programming language. People have used it before with Arduino, so it’s been proven to be working, you can check this out. We will send ‘Hi’ from the Arduino to the Raspberry Pi every 2 seconds. Here is the Arduino source code. Run Python 2 on Raspberry Pi. You will find this from the menu under Programming, you should use Python 2 not 3. Now plug in your Arduio and run the command again. If a new name appears, then this is the name of your port. The second argument – 9600 is the baud rate and should match with what you set in the Arduino program. You will need two hit enter twice after you type the second line. Messages ‘Hi’ should now start to appear every 2 seconds. You can press Ctrl + C to stop (interrupt) the Python program. In this example, Raspberry Pi will be sending back a single number, and the Arduino will turn on and off the LED on Pin 12 so many times. Now you should see the LED on the Arduino light up 3 times. There you go, be creative and you will find there are so many things you can do. For example we could control some motor or LCD on the Arduino from the Raspberry Pi. can you explain why you need to use Python 2 and not 3. I have some code working on 3 hence need it to work on python 3. Your article is very clear and useful. Can advice you about my Java library for PC/arduino communication called Ardulink? Whit it I’ve connected a PI with arduino via USB cable like you but with Java. I’ll take a look to your other guides in order to understand if Ardulink can be used also with I2C or GPIO. I want to ask. What if the raspberry pi sending many data or number to arduino? do you have some reference code? thank you. Thanks for useful example which got me going easily. Uno3 is gathering times for activities and sending through to Pi for further processing as required. I can identify the usb port as you explain. The new Pi has 4 ports. Different users are plugging in different things in different ports (memory sticks) at times so the serial.Serial is not constant. //read up on how to get your raspberry pi to tell you what the correct serial port name is! //Yours could be ACM0 or it could be something else. ser.write(‘9’) //using then number 9 just as an example. This program only transmits ONE byte! //this is the LED on the UNO board, no need to wire one up externally with a resistor. When the python script is executed on the Raspberry Pi, the LED's should blink a few times rather quickly (too fast to count) on the arduino as the serial connection is established. Then, after the 2 second timer has expired you should be able to count the LED blinking (in this example, 9 times). Love it when it finally works! Now I have to figure out how I can send more than one byte. Dude , saved me a ton of time trying to figure out the import bug , a bit new to programing so didnt think of that being a problem , thank you very much !!! i want to send a character to arduino…but it seems dat the echo command is not doin the trick…it initiates the communication which i knw as the arduino blinks initially….i guess the arduino is getting reset as the echo command closes the port after sending the character and the arduino has little time….here is my code …help me out!!!!!!!!!!!!!!!!!!!!!!!!!! Arduino to Raspberry Pi with USB Serial Connection. Quick Guide to Connecting your Raspberry Pi to Arduino via USB Cable. Thanks so much for writing this tutorial. This helped me get up and running quickly with comms between pi and Arduino for the irrigation controller I’m building. Much appreciated! I am trying to capture output from an Uno R3 on a Pi B+ and am at a loss because your sample code is not working. I verified that ttyACM0 is the correct device and used both the sample sketch you provide and the Python code. I see no errors in either code, and everything appears to run properly, but “Hello World” never appears on the Pi. Here is the code that I am using for confirmation purposes. And here is the Python code. What am I doing wrong? Is here something about B+ that invalidates this code? but what, if I want to let the led blink 10x or 25x? Is there an easy way to handle numbers with more than one value? inside the call of the light function, you substract a null from the incomming byte. Is this null a part of the ascii-string, wich was send by the RasPi? I guess, it is the null terminator and I have to delete it from the received string, because if I don’t, the value of the incomming byte is interpreted as decimal ascii string, so the LED will blink 49 times in case of one. Subtracting character ‘0’, you can convert the input char into integer. For example char ‘7’ has ASCII 55, and char ‘0’ has ASCII 48. so ‘7’ subtract ‘0’ you get int 7. Thank you so much for this helpful tip. Saved me a ton of time and effort! is it a library for php? or in command line? or maybe you can execute phyton code in php? Can I use this to communicate with an arduino due board? get that “perfect balance” beteen supeгb usability and appearance. the blog lоads extremely fast foг me on Internet explorer. Hi Oscar, thanks for your tutorial which I’m using to control my heating. Now I finally understand how things work! I have not thought about the usb connection between Pi and Arduino before, maybe to simple! For a few days I have been locking at wifi shield with antennas for the Aurdino, but a Pi with a wifi dongle is a more powerfull and cheaper wifi connection :) !! And in addition the Pi can do other things aswell! I wonder if anyone can help. With two arduino Leonardos connected via a powered USB hub to a raspberry pi (rev A), and communicating perfectly (via usb serial) with bash scripts running on the Pi, after several hours i lose ethernet coms on the pi and it subsequently reboots (maybe watchdog is doing this, not sure). i have over 1 amp of 5v supplied to the pi, and the Leos are powered by the hub and continue to run just fine after coms are lost, so i don’t think it’s a power supply issue on the pi. any other ideas where i might look for the cause of this frustrating problem? thanks. Hi Pete, did you see my reply to the last comment? have you tried powering the arduino Leonardos using external source? see if that fix your problem. is there any other components you are running on the Arduino? This may be a silly question, but is the Pi powering the Arduino via USB also? If I don’t want to run the risk of making the Pi brown-out and reset can I apply DC power to the Arduino in this case or is that a bad idea? Much thanks, this tutorial may help make possible a project I’m working on currently. In theory you can. Recommended current output of the USB pin from RPI is around 100mA, and the current input of the Arduino Uno is 70mA, so we have just enough current to run an extra LED on the arduino. But if you want to add any more current driven devices on the Arduino, you will need an extra power source (e.g. 9V battery) to the Arduino. Thanks for your great post. I followed your tutorial and connect Raspberry Pi and Arduino Nano V3 with a micro USB cable, and it works fine! However I meet a problem after rebooting the RPi: the serial port of Arduino is not listed when I try “ls /dev/tty*”. I pressed the reset button on Arduino board several times, and it didn’t help. I have to unplug the Arduino and plug in again to make RPi recognize it. I wonder if you have ever met this kind of issue, and if you by any chance that know a workaround for it? Thanks in advanced. I have had a similar issue. Did you find a solution? “…the arduino serial device takes some time to load, and when a serial connection is established it resets the arduino. For me the ‘time.sleep(2)’ could do the trick (remember to import time in py file). A better application should detect the serial device before sending data to it. What pray tell is that shield on top of the Arduino (any) doing? That is what is it wired to do. It looks rather like the prototype shield that Limor Freed also known as Lady Ada designed. Yours is the first easy to use article on the subject of connecting the two together. Great tutorial! One question: to run code on both the pi and the Arduino when sending information from the Pi, do I need to have the Arduino IDE installed on my Pi? or do I just pre-load the code I want onto the Arduino using my laptop before connecting them? I dunno if this is of any help to people out there but I struggled to do this with my Arduino Due over the ‘native’ micro-USB port (i.e. not the ‘programming’ micro-USB port that I connect to my laptop). does. This solved all of my problems. Again thanks for your good tutorials, keep up the good work. sounds like you are missing the “pyserial” library on your Pi. Install that and try again? I’m trying to send data through the USB port from my Pi to my Arduino using the php serial class and I have a problem. And I’m sending the SAME data using the php class I get valid bytes and I see them on the display. When I stop this script the data is invalid again and I don’t see anything on the screen. Maybe the python serial setup overrides the default Pi’s serial setup and that’s how it might work…? After line 2 i get an error. When changing baudrate to 9600 there is no error, but i can’t see anything on the screen after the last line and 2 time enter. What is the maximum baudrate i can use in python and how can i initiate databits and stopbit? The CellLog is sending with 128000 baud, 8 databits and 1 stopbit.